I realized it has been awhile since I last posted a fish recipe. Matt has been burned out on meatless Monday meals so he suggested we start doing fresh fish on Mondays which I am all for. If you have a local fish market I highly suggest buying the fish there, it just tastes so much better and is fresh not frozen. I buy ours at Huffs Seafood on Folly Road and I know in Charlotte at the Kings Street Farmers Market they have great fish too. I usually just ask the people what the freshest fish is and go with that. This recipe is adapted from a recipe in Gwyneth's Cookbook Its All Good- I still love my girl and her cookbook, it never disappoints. The original recipe calls for clementines which I could not find so I subbed tangelos. I think this relish would also be great with peaches or pineapple instead. The cucumber, mint, hot pepper, and fresh citrus fruit are so such a vibrant flavorful combo. I also think you could use other fish for this recipe like Mahi or Salmon- whatever you can find. This is the perfect Summer meal. Wash off fish and make sure all bones are removed. Pat dry then drizzle with olive oil and salt and pepper. Bake at 350 degrees about 20 minutes or until fish is able to flake apart easily. Meanwhile mix up the relish (tangelos thru lime juice) and season with salt. 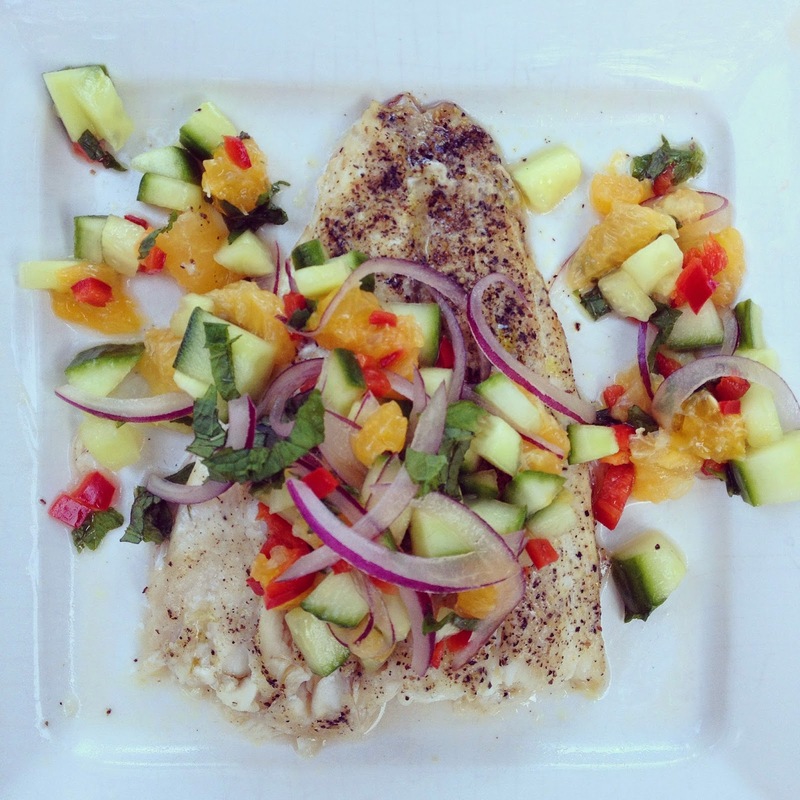 Remove fish from oven and serve with relish! I'm the weirdo that grew up on the southern coast that does not like fish, but that looks really good! That looks fab and fresh. We eat a lot of fish and I am always looking for a new dish.